In case anyone still has doubts as to who rules our lives, consider this: Today the US Congress voted to kill privacy rules which would have prevented Internet providers from selling our online habits and personal data. Because of this act of Congress, there will be no limits to the amount of advertising that will clutter our computer screens or pop up while you’re trying to read something online. Our medical information, our political preferences, and much more can now be sold to any corporation at any price. Privacy is gone forever. This is just another example of how deeply corporations control our lives. I wrote about powers and principalities the other day. Here is a perfect example of the powers and principalities at work. Corporations working with Congress and White House to undermine what is left of our democratic ideals. And all for what? Money. Nasruddin was walking in the bazaar with a large group of followers. Whatever Nasruddin did, his followers immediately copied. Every few steps Nasruddin would stop and shake his hands in the air, touch his feet and jump up yelling “Hu Hu Hu!”. So his followers would also stop and do exactly the same thing. “That’s the easy part! Every morning I count them. The ones who have left – have reached enlightenment! There is freedom in the ability to laugh at oneself. Nasruddin had this freedom. Unfortunately, it’s not something you’ll find in most “spiritual” people. Today’s Gospel reading (Mark 9:17-31) brings us into the midst of a turbulent scene. A whole village is in an uproar, with recriminations and blame all around. After an amazing mountain-top experience that Jesus shared with three of his disciples, Jesus comes down from the mountain into this village where the other disciples – the ones who didn’t go up the mountain with Jesus – were incapable to heal an epileptic boy. We usually focus on the father and the boy, other times we focus on the disciples, but rarely do we focus on the village, the social context in which this miracle took place. This is unfortunate, because the social setting is always important in the activities of Jesus. This raises a serious question: Is there a connection between the boy’s condition and the faithless generation? “How long has he had this?” Jesus asks. Since childhood, the father answers. Of course the Gospel writer attributes the boy’s condition to a “dumb spirit”. This is normal in a society that didn’t have medical terminology. 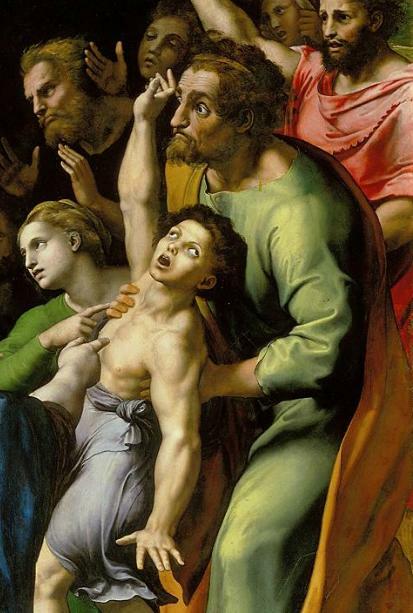 Clearly from our perspective we say that this boy suffered from epileptic seizures. But is there a deeper spiritual message? Does this child’s silence typify for us what happens in a society that is faithless? In such a society, there are few options available: You conform, or you get out, or you keep quiet. I’m not saying this is the reason for the boy’s silence and epileptic attacks. But I am saying that this miracle story has many levels of meaning. Perhaps not all of these levels were intended by the Gospel writer, but we as readers of the Gospel in the 21st century bring our own awareness to the miracle story. As this is the Gospel reading for the Fourth Sunday of Lent every year, I have had the opportunity to preach on this Gospel passage 28 times! So over the years I have been able to focus on many levels of meaning. This is a healthy response, the kind that Jesus always looked for – a response that opens new awareness. I can imagine this man getting out of the suffocating society of the village. Very often enlightenment comes to those who get out, as Nasruddin joked. Get out of what? Perhaps get out of the village. But, more importantly, get out of resignation. Get out of the “impossible” trap. Get out into the wide open spaces of discipleship. The most liberating experience is to follow Jesus. And not drop out like Nasruddin’s followers. The enlightenment Jesus brings is the life of the possible. With him everything is possible. The above was given in expanded sermon form. But the delivery of the sermon was not satisfactory, so no audio file is included. Categories: Sermons | Tags: faithless society, healing of epileptic boy | Permalink. Auden wrote this poem at the outbreak of the Second World War. It was first published in The New Republic on October 18th, 1939. Auden wrote it at the beginning of a very dark period in human history. There is darkness today also, of various kinds: climate change and environmental destruction, poverty and inequality, terrorism and the threats of new world wars, racism and prejudices of many types, deadly viruses and the potential of biological warfare, tyrannical governments, electronic surveillance and cyber attacks, religious confusion, superstition and conflict, and I can go on with more. The darkness Auden confronted in 1939 was focused on one enemy; our darkness comes from many directions and different enemies. But the overall picture today is just as bleak as it was in 1939. Most of us are able to go about our daily lives without much of a feel for this darkness. We watch manifestations of it in our evening or morning newscasts, but then quickly immerse ourselves in our work, family obligations and favorite forms of escapism. That’s one way to respond to the darkness. The other way is to acknowledge it, and oppose it as “ironic points of light” in the language of Auden. I prefer the confrontational approach. Though I also have my favorite forms of escapist entertainment, I leave much room in my daily life for the Auden approach. I read, I inform myself about the world through reliable sources, I commune with the greatness of the human spirit – in music, literature, philosophy and religious writings – and I try to write and develop my own thoughts. I post stuff here on this website, though not nearly often enough. And I exchange ideas and encouragement with friends and people who also want to rise above the darkness. The friend who sent me Auden’s poem did so to encourage me. And I post it here to encourage you if you also are struggling or need reminding that you are here on earth to be light in the darkness. Physically I’m not able to take part in demonstrations or other forms of resistance, but I admire people and groups who engage in non-violent resistance and follow in the footsteps of Martin Luther King, Jr., and other men and women who took a stand for what is right. Our own Archbishop Iakovos walked hand in hand with Martin Luther King in the famous walk in Selma, Alabama. He was one of the few white clergy and the only church leader to participate in the walk! He was on the cover of the March 26, 1965, issue of LIFE magazine. 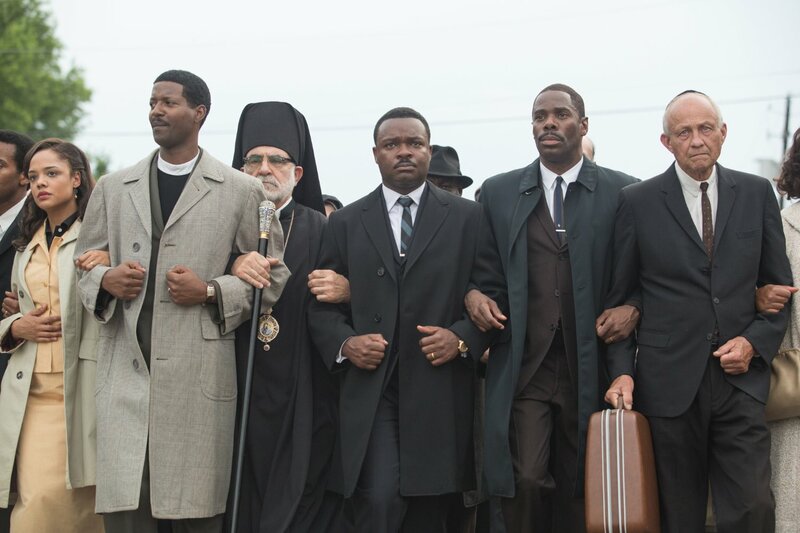 I recently watched the film Selma. An actor played the role of Archbishop Iakovos in the re-enactment of this important event in the history of civil rights in the United States. Iakovos was often quoted saying how important it was for him to support Martin Luther King and his struggle. Iakovos even received death threats warning him not to walk with King, but he did, and he made his mark in American history. On that day he was a point of light. He was one of the Just in Auden’s poem. Who are the Just? They are those who hunger and thirst for justice that Jesus calls “Blessed” in the Beatitudes (Matthew 5:6). The Greek word in verse 6 and also in verse 10 is δικαιοσύνη, dikaiosyne. It is a pity that all English Bibles translate it as “righteousness” because the most direct literal translation of this word is “justice”. Righteousness is too focused on the personal, and Jesus himself wasn’t particularly fond of righteous people if you don’t mind my saying so. He attacked those who were righteous in their own eyes or in the eyes of others. And quite frankly, few people are going to be persecuted for being righteous (verse 10). But people can be persecuted when they stand in support of justice – as Archbishop Iakovos stood on March 15th, 1965. 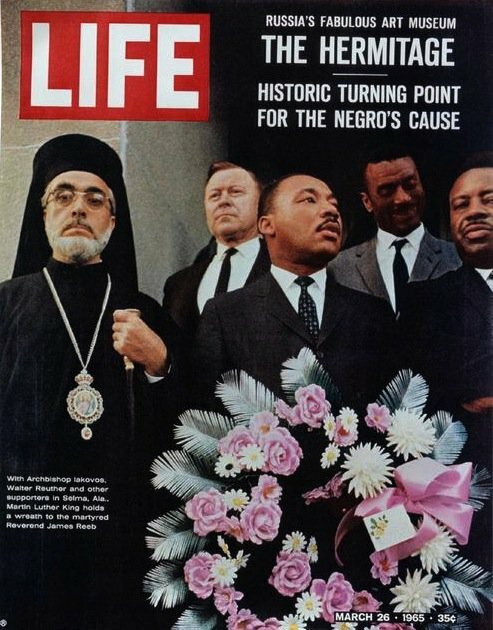 Archbishop Iakovos sends us a message today, 52 years after he walked with Martin Luther King. He sends us a message as one Just man to the Just men and women of today: Where do we stand? Do we even stand for anything? The fight for civil rights is not over, it continues. Do we care for civil rights? Do we stand with those who are denied justice? What is our own message to future generations? Do we care for our planet and its environment? Do we care for climate change? Do we care to eliminate poverty and hunger? Do we care to end all wars? Or are we too busy with our lives to care for anyone or anything else? Let’s translate Jesus’ words a little more accurately so we can hear more clearly the call to be Just. Blessed are those who hunger and thirst for justice, for they shall be filled. Blessed are those who are persecuted for the sake of justice, for theirs is the kingdom of heaven! Let’s exchange messages with other Just men and women of today, of tomorrow and of the future – if there is to be a future. 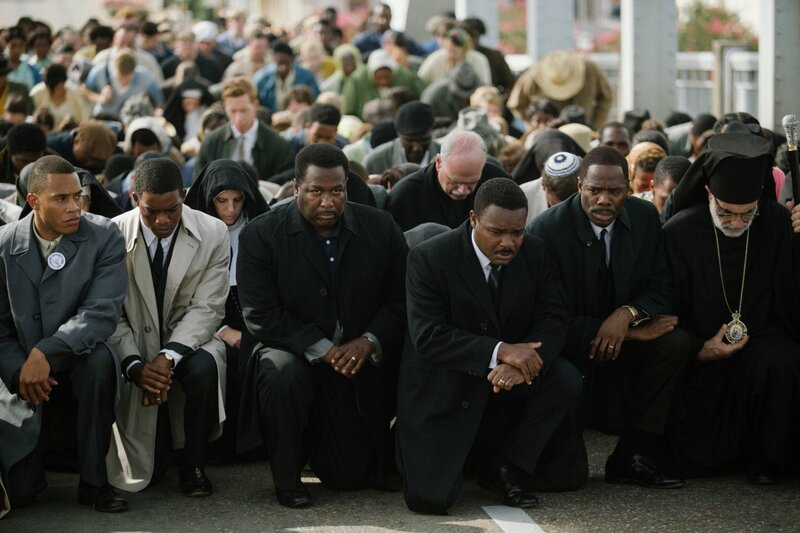 Kneeling in prayer in the film Selma. Prayer of the Just – a message to us. Categories: Global Visions, Radical Christian Thoughts | Tags: Archbishop Iakovos, Beatitudes, Dikaiosyne, Jr., Martin Luther King, righteousness and justice, Selma, W. H. Auden | Permalink. How beautiful, how simple. This old Buddhist woman who probably never heard of Jesus understood the meaning of light. She understood the connection of light and heart. Let’s hear those word of Jesus again: Where your treasure is, there your heart will be also. “The eye is the lamp of the body. If your eyes are healthy, your whole body will be full of light. But if your eyes are unhealthy, your whole body will be full of darkness. If then the light within you is darkness, how great is the darkness! Today, as Christianity stagnates in Europe and North America, the most vibrant expressions of faith are to be found in Asia, Africa and Latin America.The Korean New Testament scholar Yung Suk Kim was asked what he thought was the primary work of Jesus. Here is how he replied. I love how he translates the two verses from Mark. I believe that Jesus’ primary message is well summarized in Mark 1:14-15. “After John was arrested, Jesus came to Galilee, proclaiming the good news of God, and saying, ‘The time is fulfilled, and God’s rule has come near; change your heart and believe in the good news.” As we see here, Jesus proclaims the good news of God; it is God’s good news. Good news is about God: God’s time and God’s rule has come in the here and now (perfect tense). For God’s time and rule to be effective, people have to accept it by changing their minds, which is what metanoia means. Note the differences between his translation of Mark 1:14-15 from the more conventional translation in the Revised Standard Version of the Bible: Now after John was arrested, Jesus came into Galilee, preaching the gospel of God, and saying, “The time is fulfilled, and the kingdom of God is at hand; repent, and believe in the gospel.” Note how Kim renders the words in the RSV which I have italicized. Where your treasure is, there your heart will be also. “Home is where the heart is” – so goes a popular saying, though you don’t hear it very often nowadays. We’re too sophisticated now for such tidbits of old fashioned wisdom. Right, too sophisticated, because now home is where our smartphone is. Treasure, home, heart, light – images of God’s good news. Look at today’s miracle story (Mark 2:1-12). Let’s talk about the house where the miracle took place. You go home after a long day on the job, and you want your home to be a place of rest, of escape from all the day’s labors. But here in the Gospel was a house that was overtaken by people who came to see and hear a celebrity. And the presence of that crowd transformed that house into a church, a cathedral even. It was now a place where the Good News was seen and heard. Jesus was in the house! So what does it mean for Jesus to be in the house? Your house? This house, this church house? Our Gospel reading tells us. When Jesus is in the house, the Word is spoken. This word cuts to the core of our being, challenging us, converting us, transforming us, making us holy. When Jesus is in the house, the poor, the outcasts of society, both faithful and sinners, the strong and the weak, the rich and poor, the sick and the healthy – they will all gather, until there is no more room. When Jesus is in the house, drastic steps might have to be taken. The roof might have to be taken off. The roof that keeps us warm and comfortable in our usual ways, in the way things have always been done, comfortable in our dogmas, our culture, our Liturgy. 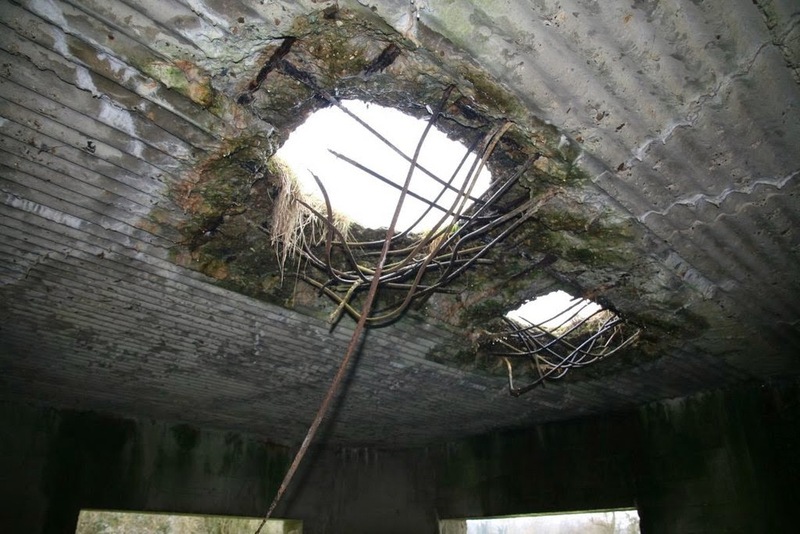 Sometimes we have to blow the roof off the way things were always done and think in new ways. Finally, when Jesus is in the house, forgiveness and healing will take place. They will take place! Regardless of how many cold hearts are around. Regardless of how little light there is. And that’s when you have to tear the roof – for healing and forgiveness to take place. As with all miracle stories of Jesus, this too is a parable in action, challenging us, and questioning us: Are we really ready for Jesus to be in the house? But be advised, we might have to tear up the roof! Categories: Sermons | Tags: BBC documentary, BBC Human Planet, paralytic lowered through roof, Yung Suk Kim | Permalink. On this First Sunday of Lent the Orthodox Church commemorates the restoration of icons in the year 843, after many decades of iconoclastic controversy. In the Liturgy we read John 1:43-51, and one can reasonably wonder what this Gospel reading has to do with the restoration of icons. I choose to dig into the symbols that abound in this Johannine pericope and reach my own understanding. Let’s start with the fig tree – a common image in the Bible of peace, tranquility and material abundance. 1 Kings 4:25 During Solomon’s lifetime Judah and Israel lived in safety, from Dan even to Beer-sheba, all of them under their vines and fig trees. Zechariah 3:10 On that day, says the Lord of hosts, you shall invite each other to come under your vine and fig tree. The fig tree is the only tree actually identified in the garden of Eden, that place of original peace and harmony with God: Then the eyes of both were opened, and they knew that they were naked; and they sewed fig leaves together and made loincloths for themselves (Genesis 3:7). The fig leaves became a cover for the peace that was lost. So no wonder, the fig tree became a metaphor in the later scriptures for the peace that was longed for. Jesus saw Nathanael sitting under a fig tree and calls him a true Israelite in whom there is no deceit – δόλος means treachery, deceit, trickery. Who was Israel? Jacob in the book of Genesis – son of Isaac, grandson of Abraham. The Heb name yaʿăqōb is connected with Heb ʿāqēb, “heel,” because Jacob was born clutching the heel of his brother Esau (Genesis 25:26), and with the verb ʿāqab, “cheat,” because Esau said that Jacob had cheated him twice (Genesis 27:36). Jacob was the original trickster. 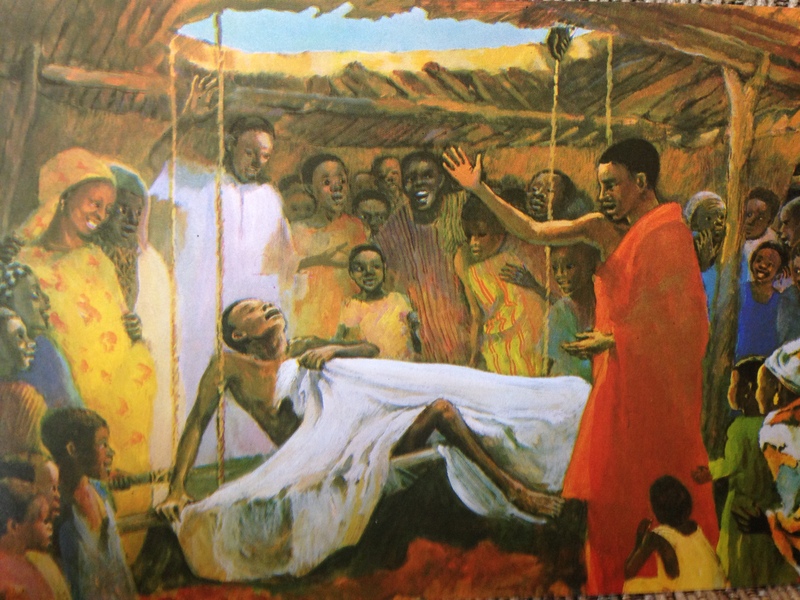 Not only did he trick his brother Esau, but Jacob also forced an angel to bless him! So by calling Nathanael a true Israelite in whom there is no trickery, Jesus is initiating a new era, a new Israel, a clean break from the origins of Israel – a new birth. And the Jacob imagery continues at the end of the episode with Nathanael : you will see heaven opened and the angels of God ascending and descending upon the Son of Man. Heaven was closed, it was now open again. Genesis 28:10-14 Jacob left Beer-sheba and went toward Haran. He came to a certain place and stayed there for the night, because the sun had set. Taking one of the stones of the place, he put it under his head and lay down in that place. 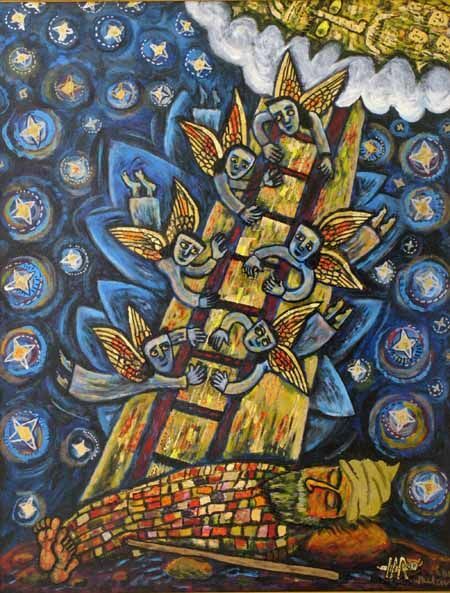 And he dreamed that there was a ladder set up on the earth, the top of it reaching to heaven; and the angels of God were ascending and descending on it. And the Lord stood beside him and said, “I am the Lord, the God of Abraham your father and the God of Isaac; the land on which you lie I will give to you and to your offspring; and your offspring shall be like the dust of the earth, and you shall spread abroad to the west and to the east and to the north and to the south; and all the families of the earth shall be blessed in you and in your offspring. 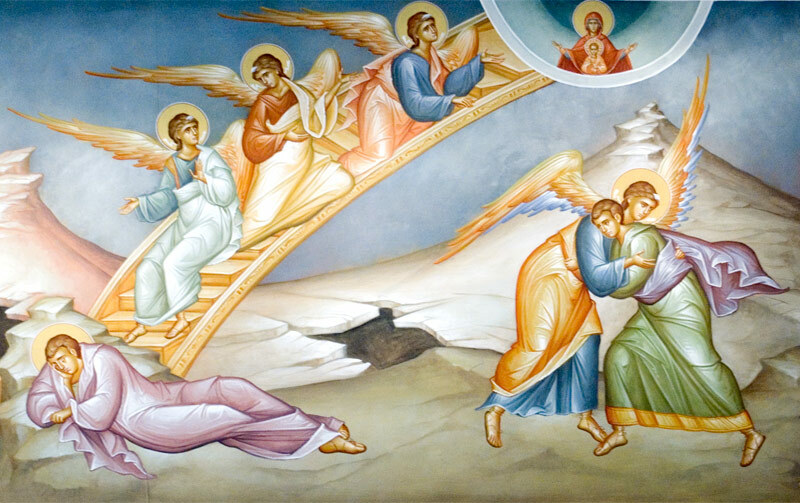 An icon showing Jacob’s ladder as well as his wrestle with an angel. The image of Mary with Christ at the summit of the ladder is retrogressive typology that is typical in Orthodox iconography, but not particularly meaningful or appropriate in this context. The promise to Jacob and Jacob’s children is now fulfilled. Nathanael is one of Jacob’s children – that’s the brunt of “true Israelite”. But unlike Jacob, the new Israelite in whom is no trickery, will not inherit the promises through trickery of deceit. Neither will the new Jacob, the new Israel, have to fight with God for access to God. The new Jacob is found under a fig tree, an image of peace and harmony, a return to Eden. The ladder that Jacob saw in a dream is no longer. The messengers of God no longer need a ladder – they now ascend and descend upon the Son of Man – the preposition epi: ἐπὶ τὸν υἱὸν τοῦ ἀνθρώπου. Heaven is once again open for business, as a friend of mine has put it. 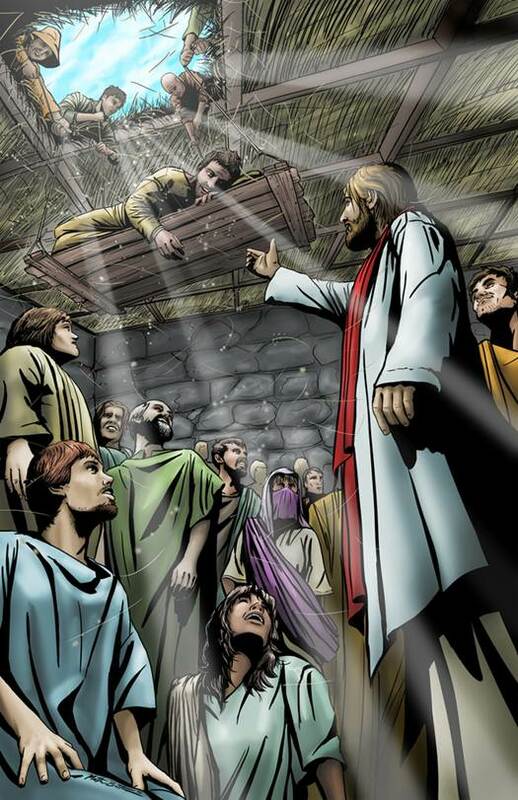 The ladder has been replaced by Jesus on earth, as the Son of Man, the Son of Humanity! Jacob’s dream of a ladder has no relation to the ladder of monastic literature. This is powerful and the ultimate transformation of religion. Three weeks from today we will observe the memory of John Climacus, John of the Ladder – famous writer of the Ladder of Divine Ascent, which became the most popular book for monks. But Jesus is not interested in ladders. Jesus is here on earth, a true son of humanity. It is through him that we enter heaven, it is through him that we become the new Jacob, the new Israel, in whom there is no trickery, no struggle with God. Jesus is the end of religion. And that, dear friends, is very much part of the lesson of today’s reading. Perhaps it is part of the meaning in having this reading in the first Sunday of Lent, on the very day in which we celebrate the restoration of icons. Much as icons are important in our tradition and spirituality, the ultimate icon is Jesus Christ himself. Colossians 1:15 ὅς ἐστιν εἰκὼν τοῦ θεοῦ τοῦ ἀοράτου, πρωτότοκος πάσης κτίσεως. And every follower of Christ, every one who is a true Israelite, in whom there is no trickery or deceit, is also an icon – “seeing that you have put off the old nature with its practices and have put on the new nature, which is being renewed in knowledge after the image of its creator” κατ’ εἰκόνα τοῦ κτίσαντος αὐτόν (Colossians 3:9-10). The ladder of human effort has been replaced by the icon of a human being fully alive. St Irenaeus of Lyons wrote, over 1800 years ago, “the glory of God is a human being fully alive.” Be alive in the glory of the Lord. Let is shine in you. Heaven is open to you today. Categories: Sermons | Tags: fig tree, First Sunday of Lent, Icon, Jacob | Permalink.